Delivering in both looks and performance, with its contemporary styling the Rangemaster Professional Deluxe takes cooking to new levels. Taking the very best from the Professional Plus collection and adding a host of innovative, up-to-the-minute features the Professional Deluxe delivers in all areas. The 5 burner gas hob with cast iron pan supports also benefits from a powerful 3.5kW Multi Ring Burner which is perfect for Asian style cooking and includes the Rangemaster wok cradle as standard enabling the stable use of a round bottomed wok. The Professional Deluxe comes complete with a dishwasher safe, robust cast aluminium griddle which sits on the hob, providing a sturdy cooking surface ideal for cooking bacon, searing steaks, burgers and fish. The single handed ignition system leaves one hand free for cooking by easily lighting burners with just one twist of the control. If you don't have mains gas an LPG conversion kit can be requested free of charge with your cooker at the time of order. The main difference between the Professional Deluxe and Professional Plus models is the left-hand Multi-Function oven which offers eight functions and totally flexible cooking options. The Multi-Function oven has both fan and conventional functions combined with grilling, base heat and browning elements all of which can be used individually. Other useful features are the defrost setting where the fan draws cold air from frozen food without using heat thus speeding up the defrosting process along with the Rapid Response setting which utilises the top element to heat the oven to temperature 30% faster than using just the standard fan setting. The Rangemaster Professional Deluxe also features the upgraded Glide-out Super Grill. The deeper grill pan glides smoothly out on telescopic runners, making it easier to safely check on your food by eliminating the risk of pulling the grill pan out too far. The new and improved four-way trivet offers greater flexibility and increased cooking capacity with four different height options to suit every type of dish. The dual circuit grill also has both full and half grill settings for both ease and economy. 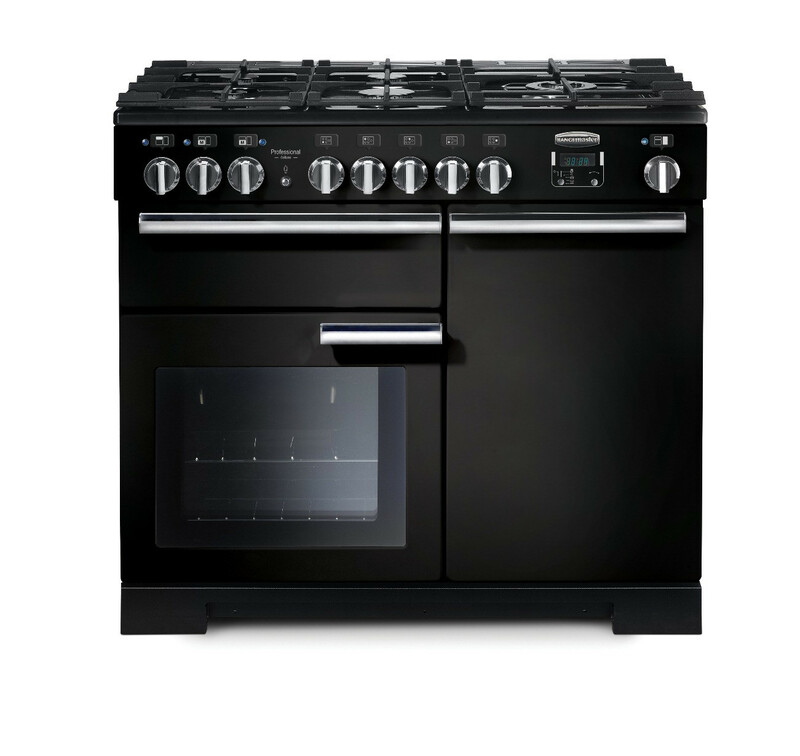 Available in a wide selection of colours there is a Rangemaster Professional Deluxe 90cm Dual Fuel Range Cooker which will look perfectly at home in any kitchen. Choose from an extensive colour palette of black, cranberry, cream, white, stainless steel or slate combined with a stylish chrome trim.